Last Thursday, I shared the first five things I wished I knew before I started my B2B sales career. It’s not all about my personality. Business acumen matters more than sales acumen. Asking great questions is better than giving great answers. The ability to write is as important as the ability to talk. 6. The quality of my product/service doesn’t matter as much as my ability to uncover new problems or opportunities. It took me a few years to understand that building a better mousetrap wasn’t the key to success in growing a business, and certainly not in selling. I still remember sitting in the parking lot at a McDonalds in Phoenix, AZ. I was about three months into my first true startup. My parents put much of their retirement savings into the business to get us started, and let’s just say things weren’t working so well. I was less than halfway into what I expected to be a two-week sales tour that would vault us to a revenue explosion. The problem was, I was getting absolutely no response. I could get people to meet with me (three of those people actually offered me a job), but I couldn’t get any action towards purchase. Sitting at McDonalds, I really began to think we had made a major mistake in starting the business. What I knew was that we had a product that was superior to the one the market was currently using – but they didn’t care. Luckily, I figured out why, and learned this lesson quickly: It wasn’t the quality of my product/service that mattered – it was my ability to connect, challenge and teach my customer about their business. I had to learn how to do it in a way that didn’t come across negatively, but my ability to simply tell a great story wasn’t enough. In that moment, I made the most valuable discovery I’ve ever made in business. My ability to understand my customer’s business better than they do was the key to my success, not my ability to understand my business. 7. The quality of my product/service is really important. All that being said, the importance of a quality product/service is of no less value than I thought it was. But, the definition of quality was different than I expected. I learned that customers don’t care about your products or services. They don’t really care about your supposed solutions either. What they care about are results. My job was to communicate the results my solution provided. I learned that I had to make a clear promise. The ability of my product/service to deliver a compelling result is the factor that defined the quality. When I started selling, I spent a lot of time paying attention to what the competition was doing. I kept my briefing books and strove to differentiate myself in all ways possible. Differentiation isn’t the reason people buy from you, it’s the result. The more attention I paid to my competition, the less effective I was. Conversely, the less attention I paid, the more progress I made. This does not mean that I should ignore my competition. It is important to stay up on what they’re doing and what they’re saying. I need to understand their products/services so that I can objectively answer questions my prospects have. However, when it comes to actually making the sale, it’s my ability to connect with my customer and to deliver a compelling promise that matters, not the competition. 9. Working smarter is important, but you still have to work hard. 10. Closing is not the most important skill to master (but it still matters). “Close early, close often.” That was the first lesson I got when I entered sales. So, I became a closer. I knew, going into every sales call, that I had more ways to get the buyer to say, “yes,” than they had reasons to say, “no.” I could overcome objections with the best of them (and I still can). However, that approach simply wasn’t working. Buyers were tougher to get to. More people were involved in the decision. And while my ability to close still helped me succeed, it also meant I had to work harder and harder to stay successful. I realized that my ability to close was merely my ability to make up for mistakes I was making earlier in the sales process. As I began working with sales teams, who didn’t have my closing abilities, I quickly saw that the attempts to teach them how to close better were producing, at best, marginal results. Closing ability is never the problem with a salesperson. It’s always a symptom of a problem that occurred earlier in the process. The sale is made in the first half of the sales process, not the last. That being said, people still hate making decisions. It’s easy for decisions to drag on, and indecision to take root. A salesperson’s ability to take command and lead the prospect/customer to make a decision is still crucial for success. 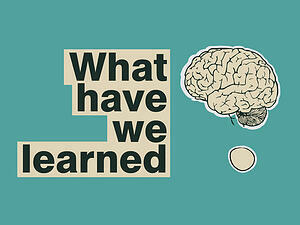 What lessons have you learned throughout your career that you wish you had known before you started? Please share them by leaving a comment below.